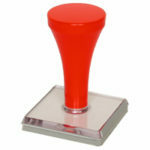 Rubber Stamps come in a variety of sizes to suit your needs. If you are unsure of the best stamp size to order or you are not quite sure how you want the rubber stamp set out, send us a rough draft of the the text/tabulation for your stamp. Let us know what the stamp will be used for or what area it needs to be stamped in. This will enable us to sort out your best option for you. A proof can be done and we will forward the artwork to you for your approval. Advise if changes need to be made and we will send another proof of your Rubber Stamp. The first proof is free of charge. Any subsequent changes/proofs for the rubber stamps may incur a small fee. Visit our online store to see some of the sizes available. To keep your stamp impression at its optimum best , wipe the rubber stamps with a damp cloth to remove any paper dust that can become lodged in the rubber. This clogging can occur after continued use. Rubber stamps are used with a separate stamp pad which can also be purchased from us. To prolong the life of the pad it is best to keep the pad away from direct sunlight as this will tend to dry it out. Artwork for Logos can be sent as a pdf or eps file and must be a minimum of 300 dpi. Images must be black and white. To find the Rubber Stamp size to suit your requirements follow this link.